The Gods are at war. And YOU must lead them to victory. 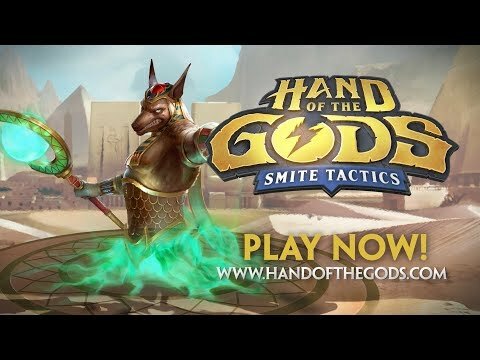 Introducing Hand of the Gods, the ultimate strategy game from Hi-Rez Studios. The Gods of SMITE have entered the Battleground of the Gods as collectible cards. Select the Pantheon you will represent, build an army from heroes and creatures of mythology, and lead your army into battle against other players. It’s up to you to command your gods, strategically position your forces, and unleash divine powers to defeat your foes. Please click on the questions below. If you have further questions, you can log a support ticket here. 1. What is Hand of the Gods? Hand of the Gods is a strategic card game featuring gods from the hit game SMITE. Play cards from your hand and watch your units come to life on the battlefield! Amass an army and play powerful spells to destroy your opponent’s Summoning Stone and claim victory! 2. On which platforms is Hand of the Gods available? Hand of the Gods is available on PC, Steam, Xbox One, and PlayStation 4. 3. Is Hand of the Gods cross-play? No, PC, Xbox One, and PlayStation players will only be able to play against players on their respective platform. Collections are separate between platforms. 4. How do I start playing? Hand of the Gods can be downloaded on PC for free here or can be found within the Steam catalog. Xbox One and PlayStation 4 players can find Hand of the Gods within the Xbox and PlayStation Stores as a free download. 5. Do I need a Hi-Rez account to play? You will need a Hi-Rez account to play Hand of the Gods on PC. You can sign up for one here or on the game launcher after download. Xbox players can link their Xbox accounts to their Hi-Rez account here and PlayStation players can link their PlayStation account here. 7. Where’s the best place to discuss the game? We encourage all players to join our Official Community Discord and follow us on Twitter and Facebook for frequent updates and discussions! 8. Will I be able to play versus my friends? Yes! The Challenge Queue found within the Play menu will allow you to challenge and play against your friends. 9. I’m having issues with the game, where do I go to report them? Issues can be reported within the official Hand of the Gods forums or within our official Discord server. 10. What are the Keywords/Mechanics in the game? See our Advanced Rulebook for additional details on Keywords and Mechanics within the game! 11. What content do I get with the purchase of the Hand of the Gods Core Set Bundle? The Core Set Bundle is packed with 285 cards, including all cards from the Greek, Egyptian, Chinese, Mayan, and Neutral Pantheon Core Sets. 12. Will there be expansions to Hand of the Gods? Expansions are something we will look into in the future! Unlock a free Card Pack when you Follow, Like, or Subscribe to @PlayHotG!